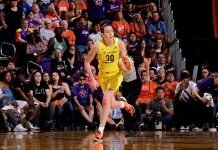 Los Angeles – San Antonio dominated the Sparks from buzzer to buzzer Sunday night, holding them to 38.7 percent shooting and taking the win, 91-71. It was the first home loss for Los Angeles this season, now 10-4. Sophia Young lead the Silver Stars with 20 points and nine rebounds, while Shameka Christon added 16 points. Christon pushed San Antonio to a quick start, as she scored 11 of her points in the first quarter. Two other Silver Stars were in double figures. The Sparks went on a 12-3 run at the end of the second quarter, and San Antonio lead only 42-36 at the half. But the visitors ignited in the third quarter, forcing six Los Angeles fouls and pushing the lead to as much as 22 points in the half. Candace Parker finished with 15 points and 15 rebounds for the Sparks, while Delisha Milton-Jones added 13. The Sparks faced the Silver Stars last weekend, at the end of a back-to-back game stance, just as they did last night. Los Angeles Coach Carol Ross acknowledged that consecutive games were the cause of more than fatigue. Silver Stars Coach Dan Hughes like his team’s effort, as well as their luck. “I knew LA was going to make a run at us. I liked the fact that we took the hit and came back and delivered a run of our own,” Hughes said. San Antonio’s next game is in three days – when they face Los Angeles again, at home. The Sparks hit the road to play Tulsa tomorrow night before heading to Texas.